As you might expect, that is more easily said than done. During the 2016 American Solar Challenge the team gained priceless knowledge about logistical processes and team dynamics. But when we turn our attention to BWSC, a competition that takes place halfway across the world and not in our back yard, everything gets much more complicated. Because of this, we assembled a logistics subteam to ensure we perform at our highest. To chronicle our journey back to Australia, as the team's Logistics Manager I decided to write a series of blog posts about logistics to give you some behind the scenes insights on how we approach races. To begin, I'll talk about our current situation as well as a few of the things we first learned about Australia. To compete in BWSC, or any solar competition for that matter, a significant amount of planning and foresight must be done for it to run smoothly. Our team hasn't been to Australia since 2001 and in these sixteen years, not only has there been a complete turnover of team members, but also a discontinuity of knowledge transfer in regards to logistics. With that said, the majority of what the logistics team has done in preparation for BWSC has been researching and gathering all pertinent information, creating a platform on which future teams can build off for future races. To build up our knowledge base, the logistics team has been hard at work over the past several months finding out everything we can about BWSC and Australia in general. At first, we learned the basics: the same thing tourists might want to know before they visit the country. 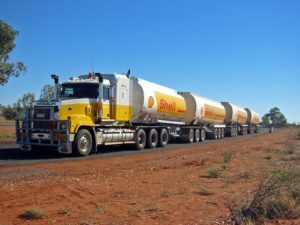 A few interesting factoids we first uncovered come to mind such as the existence of large vehicles called road trains that barrel across the long, straight Stuart Highway (the same road that most of BWSC is held on). These jumbo tractor-trailers can weigh up to two hundred and twenty tons and can be almost of two football fields in length. In addition to road trains, we learned about bushfires that are apparently commonplace in the Outback. In previous years, some fires got so bad that they actually had to postpone the competition. Information like this is good to know, and we would definitely have been surprised if we hadn’t done our research beforehand. However, for our trip to be successful it’s going to take more than the anecdotal information such as what was discussed above. After all, we’ll be racing a solar car in a foreign country, things are bound to get complicated and the more practical information we have, the smoother things will go (or that is at least the plan). In the next post, I'll talk about shipping, one of the most important logistics considerations for our team. Thanks to our friends at Principia for helping us gather this information, as well as the American Solar Challenge staff for organizing the 2017 ASC conference and facilitating our discussions.